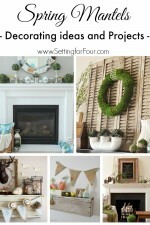 Decorating for Spring doesn’t have to be time consuming or expensive! See my easy Spring Mantel Decorating Ideas to add to your mantle! 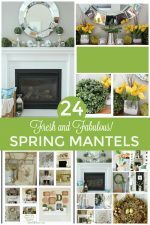 You’ll also find 25 Stunning Spring Mantel and Vignette Decorating ideas in this inspirational DIY home decor blog tour. Hello friends! 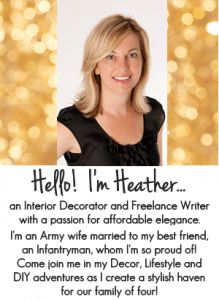 Today I’m joining some of my talented decor blogger friends in another Seasonal Simplicity Blog Tour post hosted by my friend KristaThe Happy Housie! 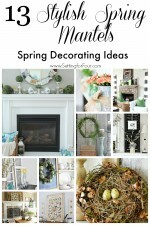 We are sharing lots of simple Spring decorating ideas to give you fresh new ideas to update your home for Spring! 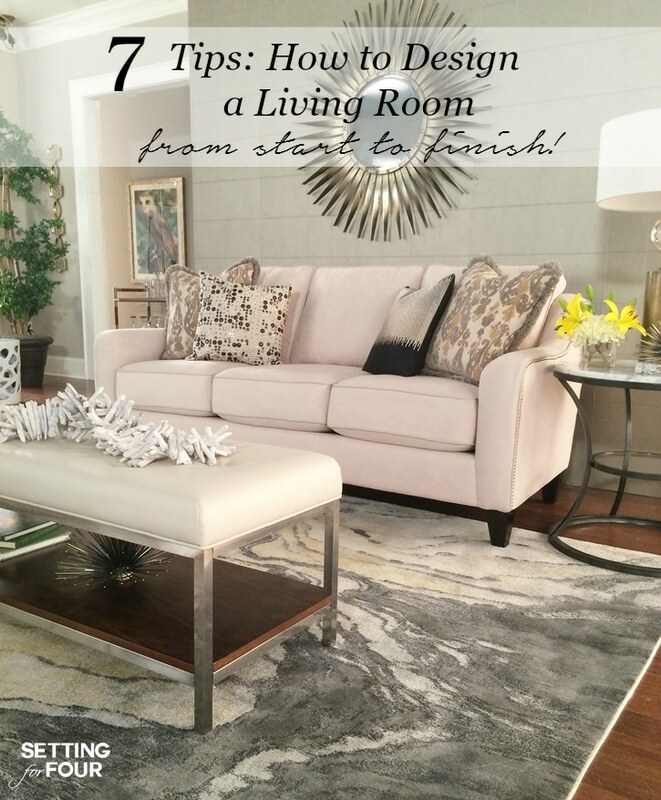 We’re transitioning from our winter decor to Spring and have lots of tips to help you do that! I’ve been sharing lots of Spring DIY, decor and recipes the past 2 weeks – I hope you have had a chance to see them! First I shared a DIY Spring Chair Wreath tutorial – it’s a fun way to add easy faux floral wreaths to your chair backs! 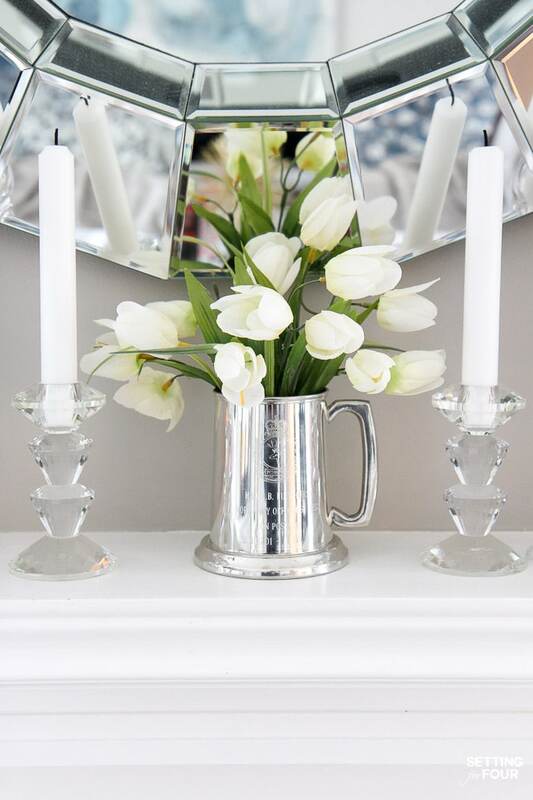 Let’s get straight to some Spring Mantel Decor Ideas! Decorating our mantel for the seasons is something I absolutely love to do! The fireplace mantel is so fun to style and add seasonal touches of color and pattern! This year I decorated our mantel using faux florals, candlesticks and ceramic pineapples which I collect and have a bit of an obsession! I love candlelight at night – the flickering, dancing flames add such a cozy vibe to our living room! I mixed some crystal and mercury glass candlesticks with white ceramic pillar candle holders. Mixing and matching metallic finishes and materials in your decor is a fabulous way to layer and add interest to your room’s feeling. To add a touch of Spring I added a bunch of faux white tulips to my hubby’s pewter military mug. 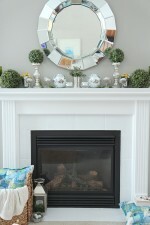 I love layering whites onto our white mantel to keep our living room bright and light filled! Shop the look! Click on the images below to see more about each item and scroll using the arrows to see them all! Next up I added two faux peonies in a gorgeous blush pink color. This is a new color for me to decorate with and I love it! 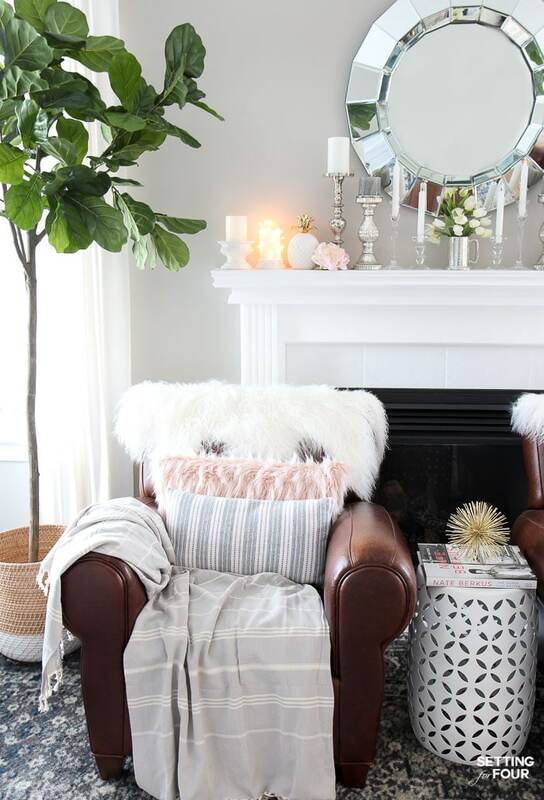 It goes so well with the gray, blue and white color palette I use in our home and this blush pink color acts like a neutral and goes with just about everything! 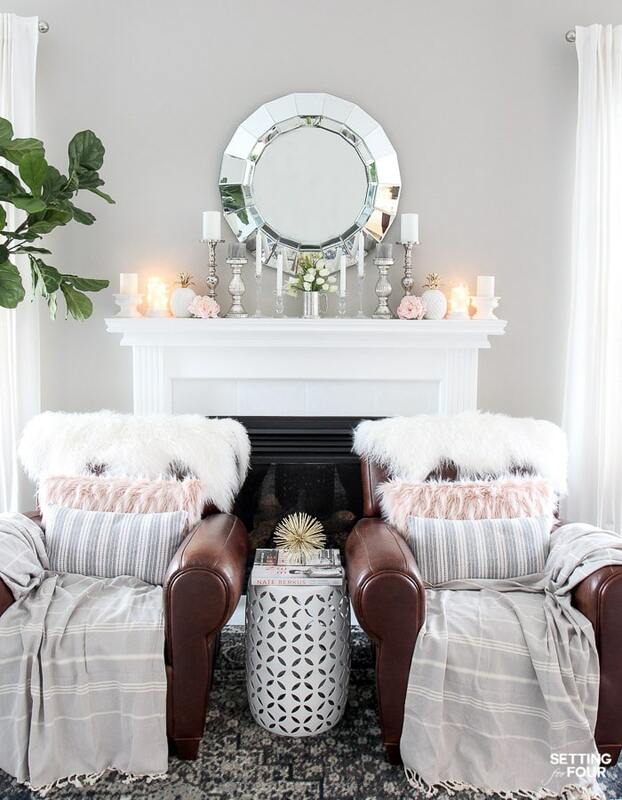 I added 2 blush pink lumbar pillows to our arm chairs that flank our fireplace to repeat the blush peony color. Doesn’t this blush color look beautiful with our blue area rug? This blush and blue color pairing is one I’ll be using more of this year! See my Tutorial on How to Paint Tile – Easy Fireplace Paint Makeover to see how I gave our boring beige fireplace tile a fresh white look! …and you can see my Fireplace Mantel Reveal: A Before and After Mantle Makeover with paint here. 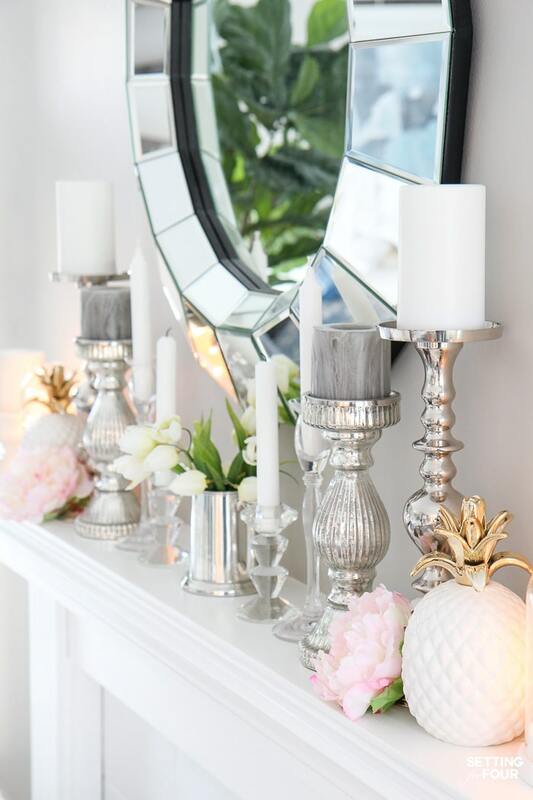 I hope you enjoyed my Easy Spring Mantel Decorating Ideas! 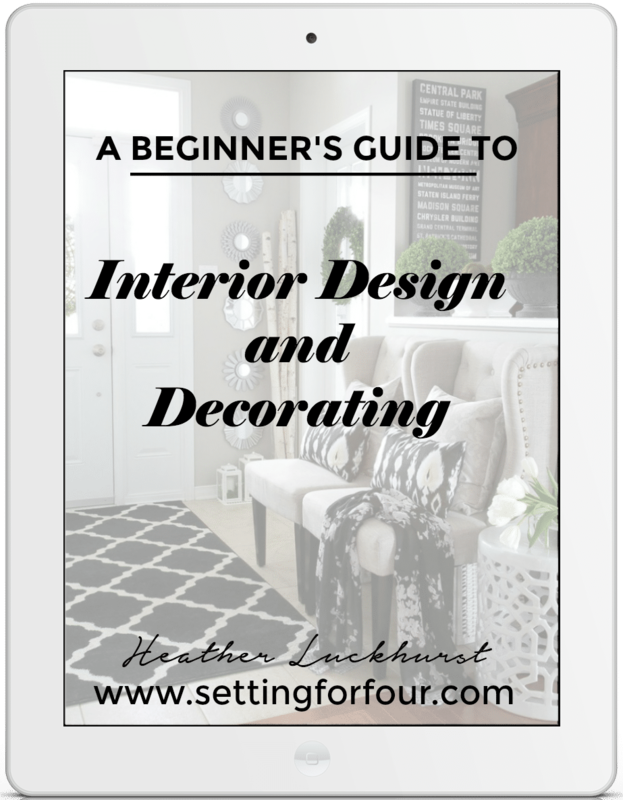 7 tips on how to design a living room from start to finish! 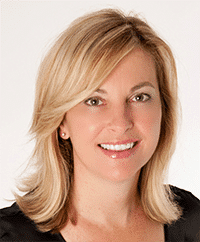 I love your mantel, Heather! The soft pastels are so perfect and cheerful for spring. Everything is lovely! Absolutely gorgeous mantel and spring vignette, Heather! So sparkly and fresh and pretty. So glad you could be on this hop! I love your mantel, the two chairs, and that fabulous rug.